I leave for work, in Pinki, every morning about 6.30 am, the journey takes about 90 minutes. I arrive home between 5.30 and 6.00. I don’t particularly mind the travelling, I have a nice car, I listen to some classic rock on SWF Rock and then tune into BBC World Service when I get nearer to Riga. What gets me down is leaving home in the dark and arriving home in the dark. During the summer and early autumn months I so looked forward to getting home and then getting my hands dirty, it was so therapeutic. December was a fairly uneventful month. Apart from a 4000 km car journey to Scotland and then to Manchester over Christmas holidays, where I left my lovely Opel Vectra to be sold by my brother, very little of note happened. The builders are all out of the house now so I’m now left with a list of jobs to do like finishing the window surrounds inside and out where the new windows were fitted, fitting skirting boards around the bottom of walls and fitting door surrounds. I won’t bore you with the full list but I’ve realised I’m a big picture person and small details like window surrounds hold little interest to me. I find small details annoying, that’s why I love Inta, she likes small details. We’re the perfect team. For as long as long as I can remember i have had this romantic image of going into a snow covered forest, with only the sound of by boots crunching through the snow for company whilst searching for my ideal Christmas tree, chopping it down and taking it home. This year thanks to Latvian laws/customs as was able to realise my dream and it was as every bit as fulfilling as I had hoped for. 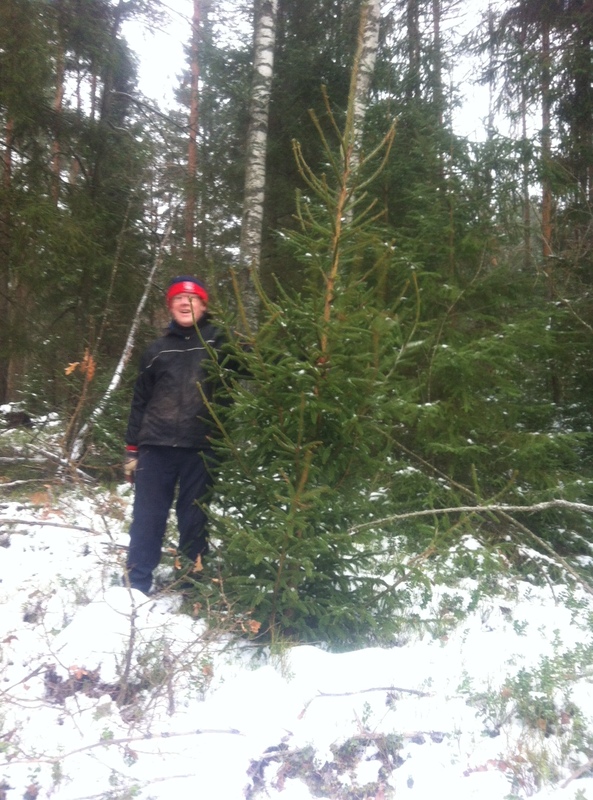 Finding the perfect tree wasn’t easy, lots of scrawny, straggly ones, but as you can see we finally found one. So rewarding to get it home and decorate it. The snow has also given me an opportunity together with a full moon to indulge in my photography interest. It’s been like white nights here in Limbazi, don’t need a torch to see where you are going, even at midnight. This was taken on a tripod at midnight, no flash but a long exposure. I’m really pleased with it. On a penultimate note I am pleased to announce that customer service in Latvia is definitely on the way up. Had to take my car to the Toyota garage for a service. Wow!! the service we received was fantastic. Apart from the garage itself looking like an operating theatre in a hospital the quality of communication was accurate and informative and we got free coffees thrown in. Just perfect, and a few days later a follow up call. A little on the expensive side but inspired confidence and I’ll be going back. So back to my original thought of the short days. Please hurry up spring. Although I’m looking forward to some really deep snow, walking across the frozen Daugava in Riga and seeing the sea frozen, I do miss getting outside in the evenings after work. I guess I will just have to content myself with planning what we should grow in our first planting season here in Limbazi. There doesn’t seem any point in planting potatoes as we can buy them so cheaply from local farmers. Any suggestions will be gratefully received. This entry was posted in Latvia and tagged Limbazi, planting, Snow. Bookmark the permalink. I would suggest planting mostly things for immediate consumption – like herbs, sweet peas, strawberries, some carrots, early potatoes etc. Vegetables to be stored through winter require lots of work and often turn out so little benefit that it’s easier and cheaper to buy them in market. For the first summer, you can plant variety of vegetables, berries and herbs and then see what grows best in particular place (very much depends on soil, natural humidity and insolation). Thanks, that sounds like really good advice and in line with my way of thinking. We grow tomatoes, cucumbers, sweet pepper (aka paprika) in greenhouse. Strawberries (need some skill), raspberries, blackberries, blackcurrant, currant, cherries, apples, garlic, dill and other seasonings, “butter” beans, green peas, peppermint tea and some thing I forgot. All that fits in something like 150 sqm. garden. Vegetables, meat and eggs are grown in our relatives eco farm at countryside. So actually our family are bad for market economics – on daily basis we buy only milk and bakery products. Thanks for the advice. I’m really looking forward to cooking and eating my omen grown produce. I would suggest growing something in greenhouse. That way you will get fresh radises in spring! And of course, home grown tomatoes are the best. Tomatoes and an onion chopped together with some salt and sour cream is the real taste of summer! Yes a greenhouse is an investment I must make. Thanks for the advice. > Yes a greenhouse is an investment I must make. Honestly, unless you plan on having a proper glass greenhouse for earlier/later harvest when it gets cold, it’s not all that much of an investment and there’s no real reason for one. Cucumbers and tomatoes grow as a charm in the far cheaper plastic membrane ones (though to be fair I was somewhat surprised at the many different types of membranes to choose from). Also less of a hassle. We have had storm accidents involving tree branches and boy am I glad it wasn’t glass. And for bonus points, birds won’t get confused and disfigure themselves on your nice glass greenhouse. I’d say just have one of your acquired handymen build it. We built our own three wood/plastic greenhouses for my family’s MASSIVE consumption of tomatoes, so, you know, just dont forget to safeguard yourself from them damned moles. Thanks for the advice. I was thinking that the membrane type was the way to go but got a little confused about all the different types after going to an exhibition in Riga last year. How do you safeguard yourself from the moles? You can try greenhouse even almost without investment – for small plants like radish, lettuce etc. you need box type greenhouse which is only 2 times higher than plants. Normally it’s 4 planks around and covered with foil/membrane. Thanks for the advice. 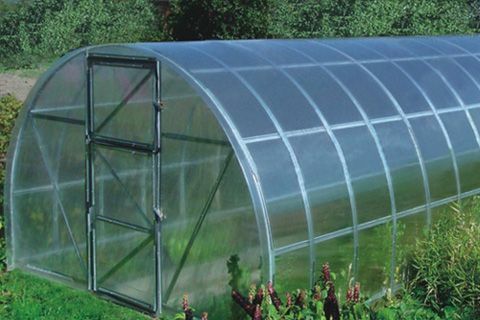 I think in England they call the box type greenhouse you describe, a cloche. For moles: we have raised beds and layers of plastic sheets in the ground underneath them, also covering the sides so it’s kind of like a pool with wooden sides and filled with soil. Sounds wonderful to swim in. 🙂 The beds aren’t too shallow and new soil and that good old cowmade fertilizer is added to the beds every year so the soil doesn’t get depleted. Pretty much covers it. Haven’t had a single mole since. Ants can be an annoyance though. The box the other person is describing is called “lecekts” in Latvian. One sort or another is of course also an option, but it’s for different plants. Aaaalmost all of ours are filled with flowers (to be cut), for example. 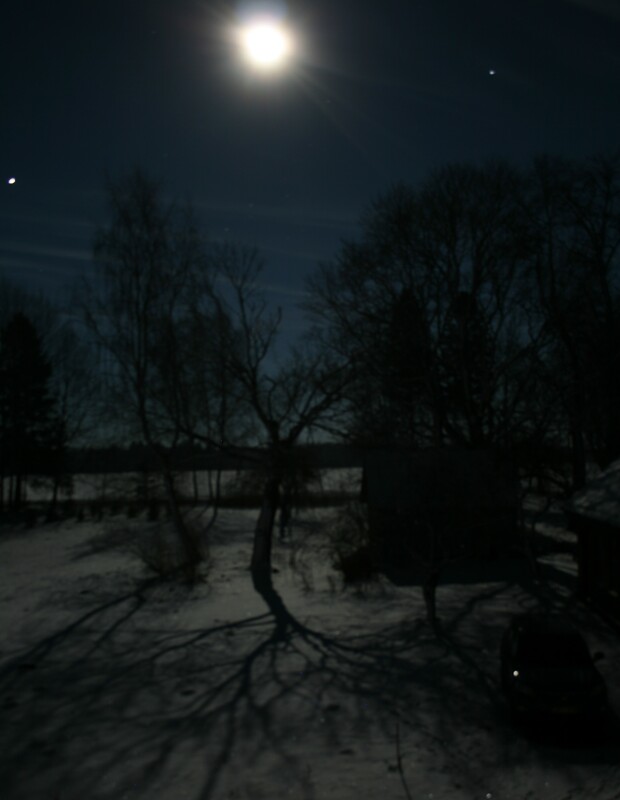 Thanks for that lovely picture of a full moon night ….can’t wait for a trip to Latvia end of January. In addition to all above – kale. Tried to grow for the first time this year and (unbelievable!) we are still enjoying it. Fresh, from the garden. Great in green smoothies, salads, soups, and stews. Need an oven first. Not upgraded our kitchen yet. Just came across your blog (there is a news post about you: http://www.delfi.lv/izklaide/divaina-pasaule/mistika/ko-par-latviesiem-doma-anglis-no-limbaziem.d?id=45451810 ) and have to say – it is interesting and easy to read. In fact, I’ve read all your posts in one go. Some are really funny – how you look at things and how you deal with stuff and new experiences. As I live in London for 10 years, I have forgotten some of the things that are common in Latvia, some are reminded only when I go back (I actually come from Limbazi district), and on most things and your thoughts I can agree, like the roads, the food, slippers and cultural events, smiling or not smiling, pets and plants, driving culture (maybe not that bad as described), etc. The Latvian word for guy – “džeks” – comes from the English name Jack. Interesting cross-pollination, just as you coming to live in Latvia and originally being from England is. It’s probably something that would be unthinkable to many Latvians! An Englishman, moving from his land of NHS and decent wages, to Latvia?! Regardless, it’s great that you have – and that you’re living in the countryside, not in a big (or small) city. Maybe you’d like to write on your motivations for moving here (other than adventure)? What made you choose Latvia over, say, France or Spain or somewhere further afield? As for spring – it’ll be here before you know it. With the weather we’re having, I’d say another month and a half before you start getting whiffs and feelings of spring regularly. Izturību! Had a busy December, so didn’t get about much. Keep you eye on the blog, will be more active in the coming weeks. Pleased you’re enjoying reading it. Nothing beats taste of freshly dug small potatoes from your garden in the beginning of summer! Some even plants some potatoes late in autumn, and then covers them up with some pile of straw or dry leaves for the winter. The potatoes then are edible already couple of weeks before Līgo. Anyway, enjoy life here, nice blog, not too long, not too short. Wine ready yet? Hadn’t thought about potatoes over the winter. Will have to try that next year. The wine is slowly fermenting behind me as I write. And yes I am enjoying life. Firstly, I have to say that I really enjoy your blog. I am student from Latvia who decided to spend my year by traveling and working abroad. At the moment I am stuck in Great Britain and it is amusing to realise that someone from England find Latvia as interesting and different as I’ve found England. Secondly, I would suggest you to build a plastic greenhouse as it is equally effective, safer and cheaper than glass ones. If storm or hard rain makes a hole, iron is all you need to fix it. But I have to mention that it needs more than good will to grow something in your garden. It would be smart to gather information early because there are so much to do before real planting starts. For example you can consult with your nearest neighbours (or good literature) how to make best of your attempt to grow something. For example, in our family we start to germinate tomato and cucumber seeds long before greenhouse is ready (early April or even March), so our first salads could be consumed during the midsummer fest. We use some small isolated room and set up some pair of “day – lights” lamps. There are so many easy tricks to make your growing experience more effective and harvest time longer. Good luck with your new garden. Thanks for the advice. I rally like the idea of talking to neighbours and the consensus seems to be that plastic is the way forward. I can reccomend a greenhouse similar to this one. Mine is rather old, at least 15 years, and the policarbonate sheet at least 6 years old. First 8 years or so we hd to replace the polyethilene sheet every 2 years. We even have a small wood stove there what I had laying around, in spring we can start with salad and redish real early, while still snow on the ground! Winter, Cross Country Skiing on your doorstep or Downhill if you care to travel a little further. Socialising, people get busy in spring and summer. Fresh snowfall is like ‘Welcome to Narnia’, the Deer will come right up to your house looking for the fallen apples from autumn. Time to join a Dance group, closest to you is probably Limbazi, you could talk to Ivars about Greenhouses, he is American Latvian and all round a great chap, there will be dancing in Limbazi this Saturday evening I think. Where can I find Ivars? Do you know where the dancing is? The nearest dance group is Ladezers, Inta is thinking of joining. Yes, 6 o’clock at the cultural centre (kultūras nams) Limbazi. Ivars lives near Vilkene. There are more British Latvians in the area too, but I have not met that many yet. Oh you should join, great fun, good exercise and almost certainly a bunch of nice people!